walkers and joggers of all ages. The New Hope Turkey Run, a fundraiser for the New Hope Improvement Association (NHIA), is arguably the oldest annual running race in the area. The first running was in 1981 which would make this running the 37th anniversary except for cancellations the year of Hurricane Fran (1996 – Duke Forest was still closed and nobody had power) and the year of the Big Ice Storm (2000 – Duke Forest was closed again and nobody had power!). In the early days, the race was planned and conducted by NHIA members who ran some but did not have much racing experience, hence the somewhat quirky character of the race that continues to this day. The race is in the Korstian Division of Duke Forest and is very low key – the exact length of the race, about 4 miles, varies from year to year so there is no “course record.” Times are recorded and awards are given to the top 3 male and female finishers. Although subsequent runners are still told their times at the finish, there are no age division prizes (except for oldest and youngest male and female finishers). What truly sets this race apart from most other races is the “random draw” for the bulk of the awards. There are always 20-30 baked items made by members of the neighborhood and about that many merchandise awards from businesses in Chapel Hill and Durham. All this for a race that is limited to less than 200 entrants. Another distinction from “run of the mill” races is the light breakfast that is served after the race and during the awards ceremony. Remember, walking is allowed! Hope to see many of you there. Questions? Email walterfowler at gmail.com. 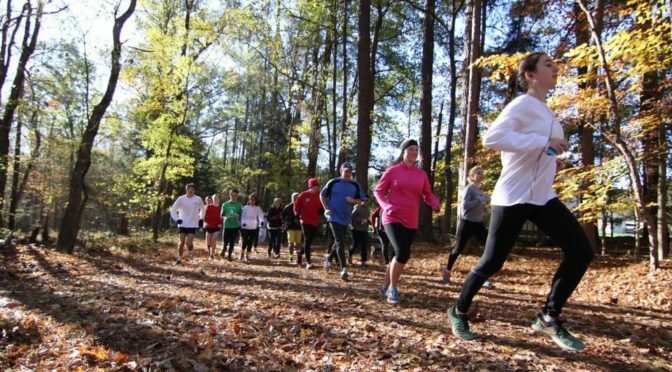 “Fundraiser blends tradition, trail run, biscuits.” News & Observer. 21 Nov 2016. “New Hope’s Turkey Run is a tasteful affair.” News & Observer. 19 Nov 2015. “New Hope community hosts an ‘old school’ race.” Chapel Hill News. 10 Nov 2014. “Turkey Trot runs smoothly.” Chapel Hill News. 12 Nov 2013.